Sometimes a DVD release feels more like the product of a daring rescue mission than it does a movie premiere. Like the producers and technicians and artisans went spelunking into some cinematic cave to pull out a frail motion picture that had fallen in the hole and broken its leg. People on Sunday is an enchanting curio from cinema's past, a 1930 silent film with murky origins, missing pieces, and a backstory as fascinating as what actually made it onto the screen. The German movie has a credits list that reads like a who's who of classic Hollywood craftsmen, but reading over the testimonials in the booklet that comes with the Criterion release of the film, there are many different takes on who did what. Given that the principle participants have long since shuffled off this mortal coil, there will likely be no getting to the bottom of it. All we have left is the mystery...and the wonderful film. 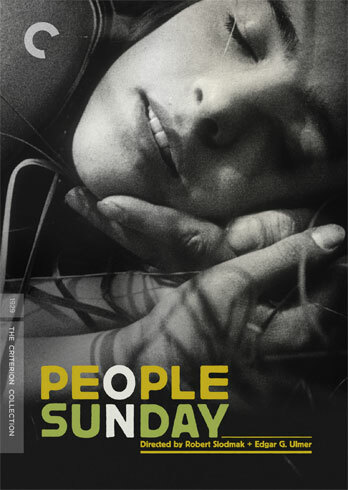 The movie is called People on Sunday, and that's exactly what it's about. Five lives intersecting on a Sunday afternoon, and specifically, four of them as they go from Berlin to the lakeside of Nikolassee to enjoy their day off. Put together as an independent production to compete with the all-powerful German studio UFA, People on Sunday was approached as an experiment. To keep costs down, the filmmakers found five non-actors and paired them together, playing versions of themselves, engaged to act in scripted scenarios, but in a manner prefiguring the Italian Neorealists. They were encouraged to be themselves, to not be actors. The five are a taxi driver, a record store clerk, a wine salesman, a film extra, and a model. The driver and the model are dating, and the wine seller is their neighbor. The other two girls are friends. The wine seller, Wolfgang, meets the extra, Christl, on Saturday and makes a date with her for the day after. She brings along her friend Brigitte, and he brings along Erwin. Erwin's gal, Annie, never makes it out of bed, so he ends up being Wolfgang's wingman for the whole day. The wine seller is a true wolf, however, and his pushy pick-ups drive Christl away, and when he then turns his attention to Brigitte, it causes drama between the two girls. 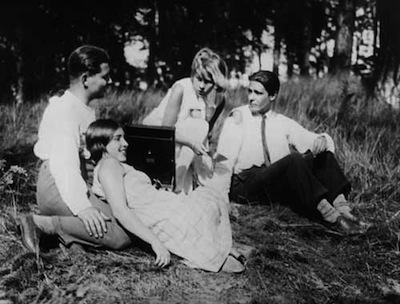 The romance plays out as they enjoy the water and the forest, having a picnic and playing records--a break from the working week, a respite from city life. In less talented hands, People on a Sunday could have ended up a mere trifle, but the eager young talent that gathered to pull this experiment off show a preternatural gift for making movies. It's no surprise that they would all eventually leave Germany and make a name for themselves in Hollywood. In terms of the credits, things break down something like this: Kurt Siodmak and Billie Wilder observed people on their actual Sunday activities, and out of their notes, Wilder fashioned a script. Robert Siodmak and Edgar G. Ulmer directed, with Eugene Schüfftan serving as cinematographer and Fred Zinnemann assisting him. In the U.S., Kurt would become Curt and would write some of the great Universal monster movies, including The Wolf Man , and Billie would become Billy, writing and directing such marvelous motion pictures as Sabrina [review] and Ace in the Hole [review]. Amongst Robert Siodmak's later credits are the excellent film noirs The Killers and Criss Cross , while Ulmer is maybe best known for Detour . Fred Zinnemann also moved on to direct, with credits like Member of the Wedding [review], High Noon [review], and From Here to Eternity . Eugene Schüfftan may be the least recognized name amongst this roster, though Criterion fans should know him as the man who shot Eyes Without a Face and Port of Shadows, in additon to some Hollywood pictures. His cinematography on The Hustler even earned him an Oscar. Schüfftan also directed three short films, and his 1931 effort Ins Blaue hinein (Into the Blue) is included here as a supplement. It's a sweet film, and a talkie--though the sound is mainly rudimentary dubbing done in post. The jaunty tale has much in common with People on Sunday: it details three colleagues from different social classes out for an afternoon ride in one of their cars. They pick up a young lady that one of the guys knows and compete for her affection before deciding to form a dog washing business together. It's a breezy bit of fun that turns to full comedy by show's end. Also in the supplements is a half-hour documentary from 2000 called Weekend am Wannsee. In it, filmmaker Gerald Koll attempts to reconstruct the history of People on Sunday, partially by talking to the man literally reconstructing the print, Martin Koerber. For anyone who ever wonders just how a film like this is out back together, there is a fascinating explanation of how many versions Koerber had to work with, where they came from, and what they each had to offer. Surviving participants Curt Siodmak and actress Brigitte Borchert are also interviewed, and the documentary explores what happened to all the players following the movie's release. The Blu-Ray of People on Sunday uses a print that cobbles together the most complete version of the film from a variety of sources. No absolutely whole version exists. Despite a warning card at the start of the movie alerting viewers to the fact that this version was pieced together from several prints, I would have never guessed. Though there is some damage and scratches here and there, nothing stands out as being obviously sourced from any different places, not nearly as much as, for example, the Argentinean clips in The Complete Metropolis [review]. The overall presentation is stellar, this rescue team brought People on Sunday out of the darkness with a minimum of injury.